Achaar and green apple add new flavors to bhel, I am pretty sure. Yummy munchie..But with achar flavors is a nice twist..
Achaari bhel sounds yum and tongue tickling ! Would love to munch on some ! Super idea . Wow that's some new flavour Harini, that bowl looks so good! Harini, I still do that, add some pickle to murmura or atukulu when I am lazy to cook just for myself. I never tried apple but add carrot, cucumber or raw mango. Achari bhel is so flavorful! wow thats an interesting bhel harini. achar and apple combo sounds good.. 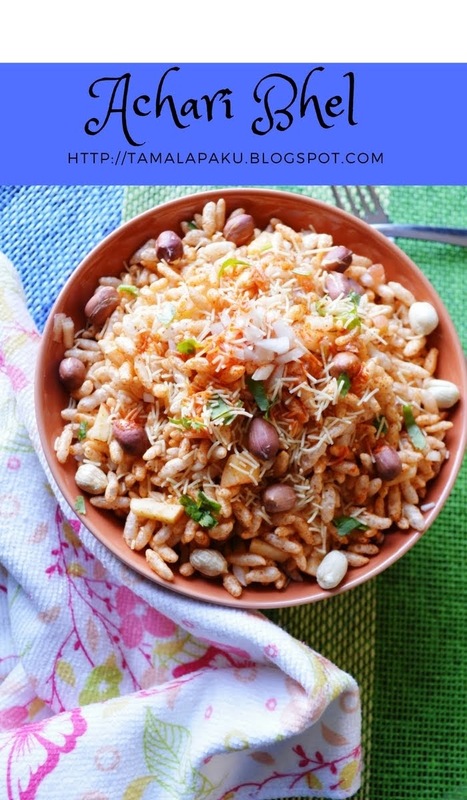 I would love to indulge in such a unique bhel like this..
Wow, what a spicy, sweet, tangy chaat that is. Never thought good old aavakaya can be used to make an addictive chaat like this. Will definitely have to try this out for my husband. This sounds too delicious. The mix of pickle, peanuts and bhel is such an amazing treat.. I have never thought of adding picl=kles in bhel. Such an addictive and spicy idea. Omg, quite a new dish for me and this achari bhel sounds absolutly fabulous. I can even say that if i make this dish i wont keep myself away from it. Am in love with this dish. Achari bhel sounds interesting and looks so delicious too. The use of achar will surely give it a nice tangy flavour.